One year out from the presidential election, much has been written about the potential impact of Mitt Romney’s membership in the Church of Jesus Christ of Latter-day Saints on his electoral prospects. His Mormon religion is thought to be of particular concern for white evangelical Protestants – a core constituency in the Republican primary electorate. Indeed, a May 2011 Pew Research Center poll found that about one-third (34%) of white evangelical Protestants would be less likely to vote for a Mormon, echoing reservations that evangelical Republicans expressed about voting for a Mormon during the 2008 GOP primary campaign. Polling in late September and early October 2011 by the Pew Research Center for the People & the Press found that among Republican and Republican-leaning registered voters, Romney held a slim lead in the nomination race. Among evangelical Republicans, however, Romney was running about even with a number of other candidates, including Rick Perry, who is an evangelical Protestant himself. The same survey also found that among evangelicals overall, Romney and Perry performed about equally well in a hypothetical matchup against incumbent Democrat Barack Obama. The polling was conducted Sept. 22-Oct. 4, 2011, which was around the time that support for Herman Cain began to rise while support for Perry started to dwindle. Since the poll was conducted several weeks ago, it does not reflect the latest developments in the presidential campaign, but it does provide a sense of the religious context of the race as the campaign heats up. As of early October, Romney held a slim lead for the Republican Party’s presidential nomination, with the backing of 22% of Republican and Republican-leaning registered voters. Among white evangelical Republicans, however, Romney and Perry received roughly equal levels of support (17% for Romney, 21% for Perry). Cain (13%), Ron Paul (11%) and Newt Gingrich (10%) also garnered double-digit support from white evangelical Republicans. Romney and Perry also received roughly equivalent levels of support from Republican white mainline Protestants (20% for Romney, 22% for Perry). 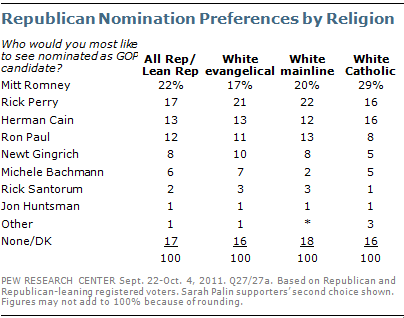 And among white Catholic Republicans, 29% named Romney as their preferred candidate, while Perry and Cain each generated 16% support. White mainline Protestants preferred Romney over Obama by a significant margin (56% to 40%) but were more narrowly divided when given a choice between Perry and Obama (51% supported Perry, 46% supported Obama). Catholics as a whole were evenly divided at that point in the campaign. Like mainline Protestants, white Catholics expressed significantly more support for Romney than for Obama (57% vs. 41%; a 16-point difference) and were also divided between Perry and Obama (53% would have voted for Perry, 42% for Obama; an 11-point difference). 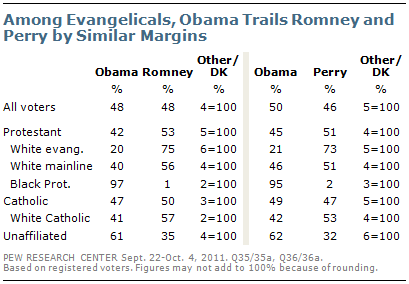 Black Protestants and people who are unaffiliated with any particular faith preferred Obama to either Republican candidate by wide margins.